- Upon exiting the first few cut scenes in this area you'll gain control of Zidane. At this point you'll learn about a crucial new function in the game: Active Time Events, or ATEs. ... but some can actually earn you items or gil, if you trigger the right ones. Consequently, you should pretty much always watch any ATEs that pop up, as they can clue you in to some important events elsewhere. This walkthrough will note any ATEs that appear. - You'll get the ATE The Forest Keeper, then regain control of Zidane. Speak to Mosco to the south if you want to save - he doesn't have any letters, alas - then head south to enter the main area of the Evil Forest. You'll start running into enemies here, which brings up another important mechanic: Ability Points, or AP. At the beginning of Final Fantasy IX your characters have somewhat limited capabilities. You can increase what they can do, and what they're effective against, by teaching them Abilities. 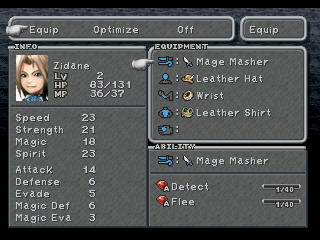 Open up your menu and look at Zidane's equipment. If you check the Ability window you'll see that there are a few Abilities - Detect, Flee, Flee-Gil, Protect Girls, etc. - on his various pieces of equipment. These are Abilities that Zidane can learn by accumulating AP, via winning battles. Abilities can then be equipped via the Ability menu to expand what Zidane can do. The Flee Ability, for example, allows Zidane to quickly and easily run from a fight, above and beyond the normal run command. Abilities require Magic Stones to equip. This limits the number of Abilities a character can equip at any one time. Characters earn more Magic Stones as they level up. Magic Stones are not expended when allocated to an Ability. Abilities can be used once an appropriate piece of equipment is equipped. That said, they can't be used if that piece of equipment is unequipped until the character has learned the Ability, via AP. Don't be too quick to sell your items, in other words. Not every character can learn every Ability. Zidane can't learn Fire, for example, as it is a spell restricted to Vivi. It is wise to learn as many Abilities for your characters as you can. When possible, swap out equipment so your characters can learn something else instead. - Follow the path through the Evil Forest northeast to hit a cut scene on the next screen. Boss time. 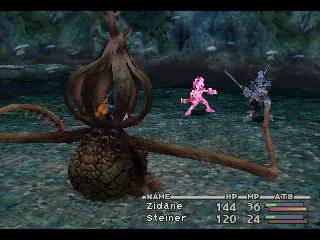 This is a fairly simple fight, particularly now that Steiner's in the party. The Prison Cage has Garnet held captive, and the Cage will either smack Zidane / Steiner or drain roughly a third of Garnet's health. The game is over if Garnet runs out of health, so you need to restore her with Potions every now and then. Smack it around otherwise. After doing enough damage Garnet will get swapped for Vivi, who will help you kill the thing with his Fire magic. During this battle you'll be introduced to yet another important game mechanic: Trance. Trance is measured by the red bar beneath each character's ATB meter. Whenever they take damage, the meter will fill up a bit. Filling the meter triggers Trance. Characters will exit Trance when this meter runs out, if they are killed or zombified, or if the battle ends. Trance is very easy to enter accidentally, so don't be surprised if you waste it fairly often. 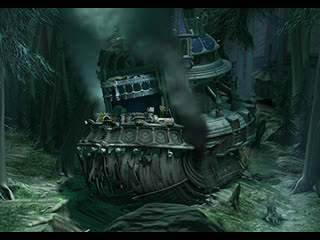 Heading down the stairs from the captain's room will earn you two ATEs, Time To Escape and Girl Who Was Left Behind. Watching Time To Escape triggers another, My Little Baby. There's a Wrist in a chest to the left of the winding stairs from the captain's room. There's a chest containing an Ether in Vivi's room, east of the winding stairs. You can climb onto the bunk bed in the rear of this room to find 116 gil. An Ether sits in a chest just south of Marcus, who's standing outside Steiner's room, west of the winding stairs. There's also an Ether inside Steiner's room, though you need to do a few things before you can get inside. In the former meeting room, near the bottom of the ship (down the stairs from Steiner's room) you can find a Rubber Helm tucked behind some rubble in the north. Check the storage room on the right side of this room for a Potion, as well. You can find a Leather Hat in the hallway just before the Prima Vista's exit. There's a Phoenix Down in the boxes just outside the Prima Vista. - Speak to Vivi, then look for Baku in the small storage room next to the meeting room. He'll challenge you to a one-on-one for the right to leave Tantalus. Fight him one room over. He's pretty easy, and often misses his attacks. Steal from him for an Iron Sword for Steiner. - Once you've beaten Baku you can leave the Prima Vista. Fetch Steiner and Vivi, and speak to Cinna to purchase items, if necessary. He's standing by the exit of the ship. 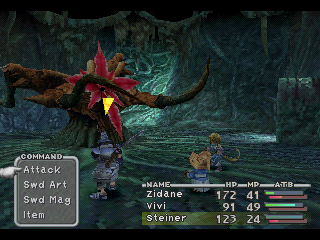 At this point Steiner and Vivi can perform joint attacks called Sword Magic that imbue Steiner's sword with Vivi's spells. Very useful. On your way out Blank will give you Blank's Medicine, for later use. - Proceed through the Evil Forest, as before. It's nice and straightforward. You'll trigger the Orchestra in the Forest ATE along the way (sound familiar? ), and near the end you'll hit a Moogle - as well as a compulsory ATE. The Moogle, Monty, is the first Mognet Moogle to whom you can give a letter. He'll read another letter, from Stiltzkin. You can drink from the right side of the spring near the Moogle to restore your health. - Boss ahead. Prepare yourself. As far as first bosses go, Plant Brain isn't too bad at all. This big beastie is similar to other plant-based monsters in the Evil Forest in that it likes to blind your characters, though most of the time it relies on physical attacks or Thunder, an all-hitting attack, to do the majority of its damage. Heal as necessary, and use either Fire or Fire Sword to bypass any blindness you can't dispel with Eye Drops. Halfway through the fight you'll be joined by Blank who will make the rest of the fight a little easier. Try to snag an Iron Helm via Steal, if you get the chance. - Defeating Plant Brain triggers a mass flight out of the Evil Forest. Fight your way out - there are only a few battles, and they're pretty simple - and you'll lose Blank from your party. At least you're out.